2012 was a bit of a rollercoaster year for me but the one constant throughout was the support and continuing growth of the network on Twitter. The Purple Dog Network now has close to 30,000 followers and the popularity of the #purplebiz competition has continued to grow. We now regularly have over 2,000 retweets per week and 1,000 mentions. Events such as #PDChallenge are hugely popular and help to keep the network fresh. As for the business side of the network, the #PDNSponsor slots regularly sell out a couple of weeks ahead and I have a steadily growing list of clients who I am supporting with their Twitter promotional activity. Much of what the network does has stayed the same, a number of other networks have come and gone but with the exception of #Bizitalk, none has enjoyed the same level of success. I have focused more on my blog and have provided lots of free advice for those looking to grow their Twitter accounts. In March, my attention was diverted somewhat by the development of the Purple Dog Network community website which received great feedback and was huge fun to develop. Unfortunately, I soon realised that I didn’t have the resources needed to make the site successful so decided to focus my efforts back on the Twitter network and my Twitter consultancy business. This was the toughest but most important decision of the year and with hindsight, I am very glad I took this step as it enabled me to focus on what I do best and continue to grow my business. The most important lesson I have learned is that as a sole trader, I need to be very focused. Working from home around my family commitments, I only have a small number of working hours, which I need to concentrate effectively to grow my business. I wish I had known a year ago, how tough it is to set up a community website and how much is involved in developing and maintaining the content. Make sure you know what it is you are really good at and focus your efforts in that direction. If you can afford to, delegate everything else to people who are expert in that field. Great advice I picked up this year from a lovely lady called Kirsten Gibbs is “Only do what only you can do!” This has helped me to find some great partners to work with so that I can free up my time to do what I do best. 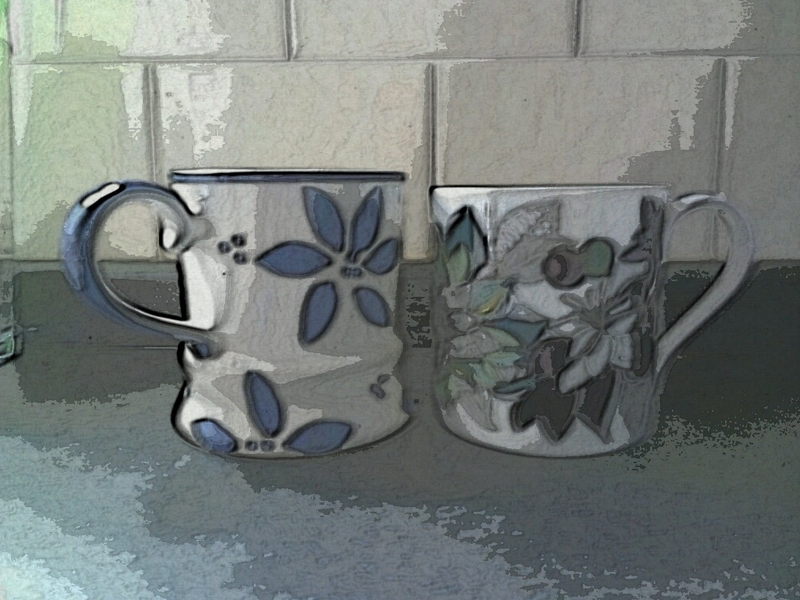 Since the closure of my community website, I have been opting for a steady growth strategy. I would like to continue to grow my consultancy business and to work with partners who add value to my business. Getting the balance right between work and home life is hugely important to me and having a steadily growing business which I can effectively manage within school hours will be my measure of success at the end of the year. www.thepurpledog.net is the website, and you can email Alison or contact her and the Purple Dog on Twitter at @purpledognet. Update 2014: Alison reports that all is chugging along well but there are no significant updates to talk about. We wish Alison and Purpledognet all the best for the future. Ooh, look – it’s only another Small Business Chat update, this time with Bob Fowke of YouCaxton! His original interview was published on 14 Jan 2012 and when asked where he planned to be in a year’s time, he answered, “I hope that we will be starting to become an established, reputable name. I’m much more concerned with quality than quantity, although we have no intention of turning business away”. Sounds good to me! So, where is Bob now …? It’s hard enough to imagine the future but even harder to remember how you imagined it a year later, but I think we’re roughly where we thought we might be, in fact we’ve done rather better than expected. We’ve become larger and employ more people/freelances, so that has changed, also we have a shop/office which allows us more access to the world – and allows the world more access to us – but we’re still very much a small specialist company trying to act for the benefit of very individual writers. We have to keep that personal touch, that’s our constant. The learning has been absolutely fascinating. I respected our writers before and my respect has increased. On a more practical note, experience has confirmed what we previously suspected – that the large self-publishing companies can be very uncaring of writers, if not downright exploitative. We (and other similar small highly skilled companies) are more necessary than we thought we were. I wish I’d known more about social media because that’s something we have to be able to help with. We’re now got someone to advise our writers – thank goodness, because I’m too much of a dinosaur. The rules are the same now as ever – whether publishing or self publishing – make sure the book is as good as you can possibly make it before you publish and, assuming readership is important to you, have a very clear idea of the potential readership. And enjoy the process, writing is fascinating in its own right and it’s easy to let the complications of self-publishing get in the way of one’s initial passion. Steady growth, keeping standards high and retaining respect for our customers. Again, sounds good to me. I’m glad to see the company is doing well and that they’re remaining flexible enough to embrace newer concepts like social media. This brings up another important point, too: if you’re not an expert in something. bring in the experts to help! Best wishes to Bob for a successful 2013. Read how he was dong in 2014! The YouCaxton website is at http://www.youcaxton.co.uk/ and you can find all the requisite contact details there. Note: I should say that I am set up to receive a referral fee upon referral of a writer who ends up being published by YouCaxton. This is not the reason I am publishing this interview. Welcome to today’s Saturday Business Chat! I’ve been meeting a lot of crafty ladies on a Facebook forum recently, and here’s another one, Victoria Burt, who runs a new business called Bags of Loveliness. This is one of those charmingly accidental businesses that grew out of a new hobby, and never having considered running her own business before (many of us have been there! ), she has had a steep learning curve, which she shares with us here. The most important thing, I think, is admitting to the odd error and learning from them. And it doesn’t help any other new businesses to think that we’re all perfect and knew what we were doing from Day 1 (I wish! ), so thank you, Victoria, for being so honest about your journey so far! I set up Bags of Loveliness in March this year. Ah….see above! I was lucky in that, when I started, there weren’t many fabric-y crafters in my area … there are a few of us now! It had never even crossed my mind. Buy zips and buttons in bulk! This is on-going really … I wish i could be organised enough to never find myself low on stock. I often suddenly realise I’ve hardly any bags left and have to have a crazy sewing mission alongside the day job, the family stuff, and my studies. Got brave enough to even try to sell stuff! I didn’t think it was good enough for a long time. Keep proper records of everything, especially communications! I’ve missed the odd craft fair booking through disorganisation and emails being buried in other emails. I hate to say it, but I may have lost orders the same way. I’m still new really, so it’s hard to say. Some months I’ve been at the post office most days, others it’s been a rare treat. And it’s been a similar experience with craft fairs too. I have had my items in a shop for a while, before the owner diversified into mostly refurbished furniture … and I’ve got some of my bags in a local museum shop. I’m also considering shop space elsewhere at the moment, in a dedicated craft shop in Swindon. Sadly, I don’t see myself giving up the day job anytime soon (partly because I love it – I work in a nursery and those kids are fab!) but I’d like to be screen printing my own fabrics, if I can only find the time to get started. NOTE: As far as I can tell, Bags of Loveliness is still going strong as of July 2014. However, Victoria has decided not to continue to take part in the interviews. We wish her and the company all the best for the future! You can visit Victoria’s website at www.bagsofloveliness.co.uk. As she mentioned in the interview, she’s on Facebook, and of course you can get in touch via email or by calling her on 07532 238 357. I have to admit that I had never given this one any consideration until it came up in something I was working on yesterday, and I had to look it up to check. So: zeros or zero? Zeros is a plural noun, and oddly enough it’s the plural of zero. No e when you have lots of zeros. Zeroes is a form of the verb to zero (in), meaning either to set a measuring device back to zero (I have never heard or read this myself, but M confirms that he uses it with measurement devices in his scientific job! ), or to home in on something: “She zeroed in on the fact that he had hidden the muddy boots in the shed”. So the noun has no e – “there are too many zeros in this post” and the verb does have an e – “my reader zeroes in on the fact that I had to look it up and contacts me to ask me why I don’t know everything off the top of my head”. It was time to create a new Gantt chart for myself to keep my various projects under control, and yet again I had forgotten how to freeze the columns and rows in the way I like. So I created this post to help myself – and you! What is “freezing” rows and columns? When you freeze a row or column in an Excel spreadsheet, you make sure that it’s on display however much you scroll down or across your document. 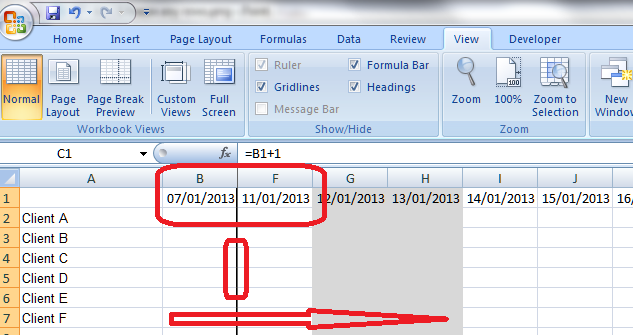 So, if you have a row of dates as a heading along the top or a column of customer names down the side, and your document becomes longer or wider than the screen on which you are viewing it, you can keep those columns and rows visible, instead of having to scroll up and down and backwards and forwards to find your headings. Where is the Freeze Panes button in Excel 2007 and Excel 2010? To find the Freeze Panes button, you need to be in the View Tab, then the long Window area. Click on Freeze Panes and you’ll be given three options: Freeze Panes (note, this toggles between Freeze and Unfreeze, as we’ll discover later); Freeze Top Row; and Freeze First Column. How do I freeze the top row or first column of my spreadsheet? 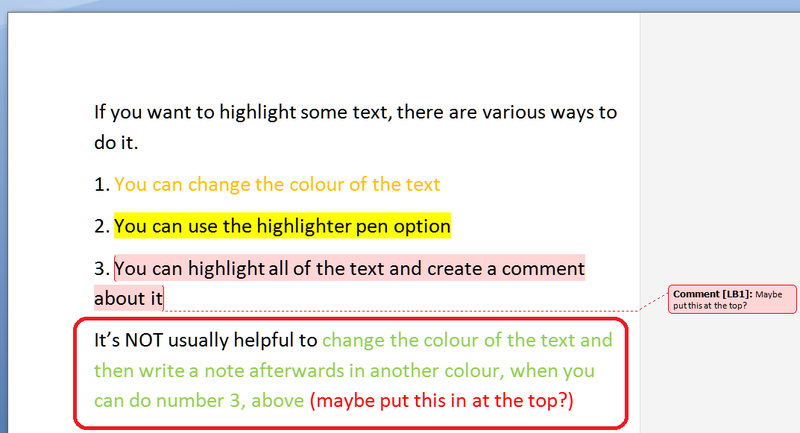 In a shock move, something that Microsoft Office gives you as a short cut is actually useful! If you click on that Freeze Panes button and select Freeze Top Row or Freeze First Column, it will automatically freeze that row or column for you. This is because the first row and column on a given spreadsheet are likely to be the ones where you’ve inserted your headers. Click on one of these buttons and you’ll freeze just that row or column. Freeze the top row, scroll down thousands of rows, and that top row will still be on show. Hooray! BUT: this will only freeze one of those two areas. Want to freeze the spreadsheet so it shows more than just the first row or column? Read the next three sections. BUT (2): this will only allow you to freeze the row or the column. If you, like me, want to freeze both a row and a column, scan down to the section titled Can I freeze a row and a column at the same time? How do I freeze a particular row of my spreadsheet? Say, for example, you’ve got a double row of headers, or you’ve inserted a graph at the top of your spreadsheet that you want to be able to see as you scroll down. This is where you need to be able to select the point at which the spreadsheet freezes. Here’s where it gets a tiny bit tricky (but you’ll save this post so you remember). 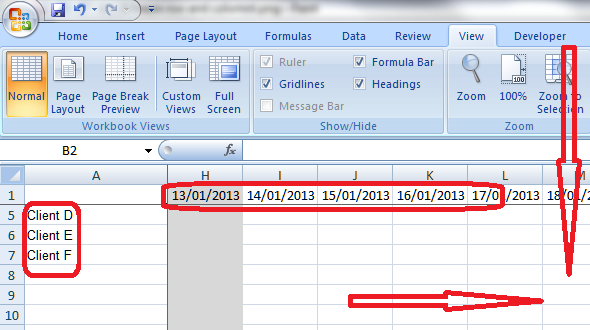 Click on the row BELOW the point at which you want to freeze the spreadsheet. Not the row you want to freeze, the one below it. In this example, we’re highlighting Row 3 in order to freeze Rows 1 and 2. Once you’ve highlighted the correct row, by clicking on the 3 in the left hand margin in this case (you can see that it’s become darker, with a line around it), click on the Freeze Panes button and select the Freeze Panes option. Your spreadsheet is now frozen at the bottom of Row 2. If you scroll down the page, you will notice that Rows 3 and onwards start to disappear, and a horizontal black line appears at the point of freezing. How do I unfreeze a row or column? Once you go to do something else with freezing, you will notice that the Freeze Panes option has changed to read Unfreeze Panes. This is because you can only do one Freezing action at a time. If you decide that you want to freeze a column instead, or want to practise doing that, you need to click the Freeze Panes button then select the Unfreeze Panes option first. Note: you don’t need to have anything highlighted to click this. It will unfreeze anything you’ve previously frozen. Oh, and you can freeze a column and row at the same time, as we’ll learn in a few moments. How do I freeze a particular column of my spreadsheet? If you want to freeze a particular column of your spreadsheet, you do it in the same way as you froze the particular row. But in this case, you need to highlight the column one to the RIGHT of the column you wish to freeze. In the example below, we want to freeze at Column B, so we highlight Column C (by clicking on the C at the top of the column). Again, click the Freeze Panes button then select the Freeze Panes option. Can I freeze a row AND a column at the same time? Sometimes you might want to freeze both the top row and the first column of your spreadsheet. For example, I want to be able to see my list of clients, however many dates come across the page, and my dates in the top row, however long my list of clients becomes. We’ve already learnt how to freeze just the top row or just the first column (see above), but as you might have realised, you can’t do both – if you go back to the menu to do the second one, it just tells you to Unfreeze the panes first. Highlight the cell ONE DOWN and ONE TO THE RIGHT of the row and column you want to freeze. It’s just like freezing rows or columns. In this case, think of the cell nestling in the angle formed where the row and column you want to freeze meet. Here, we want to freeze Row 1 and Column A so that they are always visible. So we highlight the point at which Row 2 meets Column B. Using the same procedure to freeze the panes (Freeze Panes button, Freeze Panes option), we have now frozen Row 1 and Column A. If we scroll both down and across, Row 1 with the dates and Column A with the client names are still visible. Yes, Column A will scroll and the top will slide up and disappear temporarily, and yes, the dates in Row 1 will disappear as we scroll across, but the basic principle holds good: we can see Row 1 and Column A, however much we move around the spreadsheet. We’ve learned how to freeze rows, columns and rows plus columns today. I hope you’ve found this useful. This is part of my series on how to avoid time-consuming “short cuts” and use Microsoft Office in the right way to maximise your time and improve the look of your documents. Please note, these hints work with versions of Microsoft Excel currently in use – Excel 2003, Excel 2007 and Excel 2010, all for PC. Mac compatible versions of Word should have similar options. Always save a copy of your document before manipulating it. I bear no responsibility for any pickles you might get yourself into! Welcome to the first Saturday Small Business Chat of the New Year! Settle down to have a nice read with a cuppa … Today we’re meeting Leigh-Ann Arundel of Jingle Jewellery. Leigh-Ann is expanding her business in a very interesting way that I don’t think we’ve seen in these interviews before: while she’s still working almost full-time hours in her day job, she’s using consultants and associates to grow her business and present her products. I also think it’s lovely that Leigh-Ann sees her jewellery making as a therapeutic practice that brings some balance into her life. I wish we all felt like that about our businesses – but we should be doing something we love that’s good for us, shouldn’t we! Let’s say hello to Leigh-Ann and find out how she does it. I founded JIngle Jewellery as a Limited Company in February 2012 and launched in April 2012. I work 30-hour weeks in a very demanding and difficult profession in an area which involves Child Protection. I set up my business in children’s and adults jewellery parties and retail to bring light to the shade and balance my perspective. I have always loved jewellery and am a bit of a magpie so was draw to this area of crafting. I find it therapeutic. Prior to having my children now 4 and 2 years I practised Hypnotherapy and EFT. I am often described as a person who does not do anything by halves, so basically I just ploughed in head first and set it up very quickly. I understood that branding is key and obtained the services of a graphic designer friend to help design my brand and set up with Companies House, bought my stock, obtained my marketing literature and signed up for my first Craft Fair. Did you launch full-time, start off with a part-time or full-time job to keep you going … ? I have a career which I love and maintain a 30 hour week. My business is run in every other spare minute that I have. I ended up spending a lot of money as the business took off in a direction I had not planned a lot earlier than was comfortable. I’m not sure I would have done it differently, though maybe I could have been more prepared. Firstly, set it up. I love my business and am very proud of how it has grown in such a short time. Secondly, letting it evolve around me, as through chatting to interested people it has taken on a new direction. Understand the brand and have a USP [Unique Selling Point] that makes you stand out. Listen to advice, be patient and believe in yourself. Jingle Jewellery is becoming very successful and has transformed from a hobby business into a locally recognised brand. I now have two licence holders who operate Jingle Jewellery businesses in Nottingham and Cumbria and have 10 consultants who work for Jingle on a self-employed basis, attending events and parties, making our products and also selling from our newly developed catalogue. I plan to promote the licence and consultancy opportunities next year and diversify into party services. Hopefully gaining in momentum and operating in more areas nationally as a successful business. How exciting! Isn’t this an interesting route to take – and I love the point about taking a few minutes out to be proud of ourselves! I am sure that Leigh-Ann is going to continue to be successful, combining a career and a business that she loves, and look forward to seeing how things develop as she goes into her second year of trading. You can find Leigh-Ann’s website at www.jinglejewellery.com and of course email her.